A well thought-out timber deck is the perfect foil to a beautifully presented home. Not only will it look stylish, but get the design right and it will also improve the way you interact with your existing living space by linking the house and garden. So how do you get started choosing, designing and planning your timber deck? What wood do I need for timber decking? A wide range of timbers can be used for decking. The key is to ensure your boards are fit for purpose. Look out for the ‘DeckMark’ symbol from the Timber Decking Association (www.tda.org.uk) as an indicator of good-quality materials. Softwoods are the cheapest option up front but must be pressure-treated, and any cuts should be given a coat of end-grain sealer on site. Some species, such as cedar, are naturally weather-resistant. In recent years, the trend has been towards hardwoods, such as oak, teak, iroko, and ipe. They’re more expensive but offer excellent stability and durability, as well as a top-end finish. What kinds of boards are good for decking? Typically, boards range between 90mm and 145mm in width, with thicknesses dependent on the type of timber you choose. Your local DIY shed will sell lengths up to 4.8m, but some specialist suppliers offer longer boards. Panelised versions, sometimes called deck tiles, are also available and can be easier to install. Grooved boards are synonymous with the term ‘decking’ and rightly a popular choice for simple, budget-friendly projects. For a high-quality finish, don’t rule out smooth timber. Its clean look accentuates the wood’s grain, reduces problems such as leaves collecting in grooves and – properly treated – it’s not slippery underfoot. How can I design a timber deck? 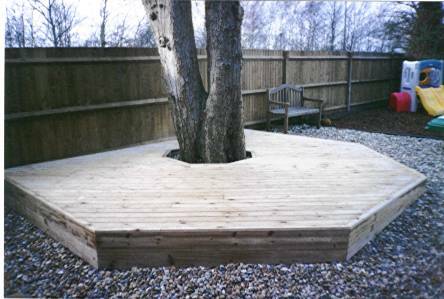 The location of your planned deck, its size and how it will be used can all have a bearing when it comes to deciding on the quality and quantity of materials you need for the job. A plain softwood design might work as a bolthole near the bottom of the garden, for example. But you may want to upgrade – either with special finishes or more exotic timbers – for a party deck that rolls out from the house via folding or sliding doors. There’s a lot of ideas to consider – how about dotting the garden with oases formed of discs of top-end hardwood, joined with paths of a different material, for instance? Whatever surface you choose, you’ll need a stable and level base for the deck. That usually means creating a raised timber framework, set atop solid pillars and fitted with joists at regular intervals. Do I need planning permission for a garden deck? Provided the finished surface is no more than 300mm above ground level, and together with other ‘permitted developments’ (such as outbuildings) covers no more than 50% of the garden area, most decks won’t require planning permission. Check with your local authority if you’re not sure – particularly if you’re raising levels, the project borders a neighbouring property or you live in a listed building or conservation area. What will timber decking cost? Expect to pay at least £20 per m2 for a basic softwood square deck completed on a DIY basis. It will cost significantly more if you’re using high-quality timbers, extras such as balustrading or a professional fitter (recommended for more complex designs). As a guide, softwood decking boards start at around £10 per m2, while hardwood timbers are priced from £30 per m2.